New World Order Gordon Brown wants to police the entire world – how controlling can a freak get? Barack Obama, Silvio Berlusconi and Dmitri Medvedev celebrate after agreeing a set of measures designed to haul the world out of recession. 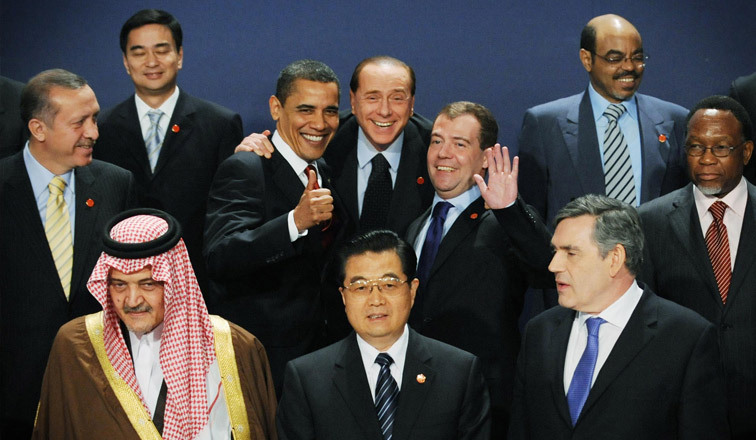 Gordon Brown, who hosted the summit, said the deal heralded a “new world order”. British Prime Minister Gordon Brown himself announced that the G20 heralded the creation of a “new world order” which would involve increased global regulation of economic markets. Still think that the ‘New World Order’ is a conspiracy theory? Now here is an interesting article from the Telegraph. Quasimodo in Number 10, hunched, scowling over his desk, has devised yet another plan to police, to increase surveillance, to indulge his obsession with extending his short-lived control over as many people as possible. Gordon Brown, who now seems to have lost his last tenuous grip on reality, wants the European Union to police the carbon emissions of the whole world. That is the leitmotif of New Labour – and, by extension, all Westminster – government: control, bans, observation, intrusion, diktat. Balked of a legal agreement on imaginary manmade global warming at Copenhagen, Quasimodo and Nicolas Sarkozy are working on plans to create a “European monitoring organisation” to oversee different countries’ actions on carbon emissions. Barack Obama – the leading control freak in the liberal pantheon – has suggested spy satellites could be used. Quasimodo told reporters: “We’re in favour of transparency; we’re in favour of looking at what’s happening not just in our country and our own continent, but around the world.” That isn’t transparency: that is snooping. “We’re in favour of transparency” – from a New Labour Prime Minister! Goebbels, who always favoured the Big Lie, would have loved it. Were Quasimodo and his colleagues in favour of transparency about weapons of mass destruction? Even now, are they in favour of transparency at the Iraq inquiry, where Tony Blair will give evidence in secret? Were they in favour of transparency when they voted to keep MPs’ expenses under wraps, until the courts overruled them? The one fear the enforcers entertain is that their spy-in-the-sky snooping on carbon emissions might antagonise China, which resists surveillance (all those covert coal mines and other eco-naughties). When Red China begins to seem like an apostle of laissez-faire, relaxed freedom, we know that the lunatics have taken over the asylum. Meanwhile, unheeding of the coming tsunami of electoral extinction, Quasimodo lopes around his bell-tower (courtesy of Quentin Davies) and plans ever tighter restrictions on everybody else’s liberties. What a filthy regime this has been. Even now the Harridan is planning legislation effectively to outlaw Christianity. Who do they think they are? When they crawled out from under that stone in 1997 they had just one ambition: to impose their will, their prejudices, their squalid vision of the world on the entire nation. That is always the badge of the inadequate, the owners of inferiority complexes, epitomised by the nail-biting, grimacing weirdo in Number 10. It is a pity that Scottish kirks do not go in for much in the way of ornamentation; otherwise, Gordon/Quasimodo could have built a secure career for himself as a gargoyle on a church tower, scowlingly overlooking the rest of humanity.